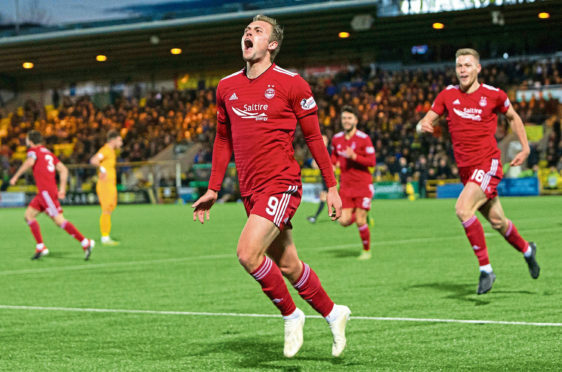 Aberdeen manager Derek McInnes has not ruled out the possibility of trying to sign forward James Wilson on a permanent basis. The 23-year-old was the Dons’ major signing of the summer transfer window, joining on loan from Manchester United, but Wilson has struggled to establish himself as a first choice. The striker, who has netted three goals in 25 appearances this season, is in the final year of a reported £30,000-a-week contract at Old Trafford but McInnes believes a move away from United will benefit Wilson. McInnes said: “For any player that comes out of contract it is important. There is a bit of uncertainty and the best way of dealing with that is to play at a level. “James has had to deal with a lot of expectation, maybe unfairly, as a young player. “He was given a lucrative four-year contract at Manchester United and so much was expected of him, but there is enough there to see there is a good young talent there who has his best years ahead of him. “Being away from Manchester United might be the best thing for him and getting on with his career. McInnes is encouraged by how three of his loaned out players have been performing. Bruce Anderson, Mark Reynolds and Scott Wright joined Dunfermline, Dundee United and Dundee respectively. Anderson has scored four goals in six games for the Pars, while Reynolds and Wright have also been earning positive reports for their displays. McInnes said: “We have watched Mark, Bruce and Scott every game, either myself or one of the staff or scouting team. “Wee Bruce is on fire. His report last week (against Alloa) was that he didn’t do a lot in the game but he took his goal brilliantly.Since Bruce has gone there they have gone right up. Reynolds, who missed the first half of the season due to a knee injury, is out of contract at the end of the season. McInnes added: “I spoke to Mark and he made the decision he wanted to go out on loan. “We based it on the fact he was coming back from a serious injury and he had to go and play games.